"The art world’s economy is sustained by underpaid or free labor across many of its sectors, from the production of art to the construction and maintenance of museums. This is manifest through the dual expectation that cultural producers work for exposure whilst institutional staff and contracted laborers work for less than a living wage. Arts-activist campaigns like W.A.G.E. and Gulf Labor have strategically focused on correcting certain inbuilt inequalities, but neither have yet incorporated a discussion of the economic underpinnings of white supremacy in the art system, despite it regularly being cited as one of the least diverse professional sectors. To cite one question, can solely economic factors account for the highly racialized split between producers, on the one hand, and ground staff, on the other? 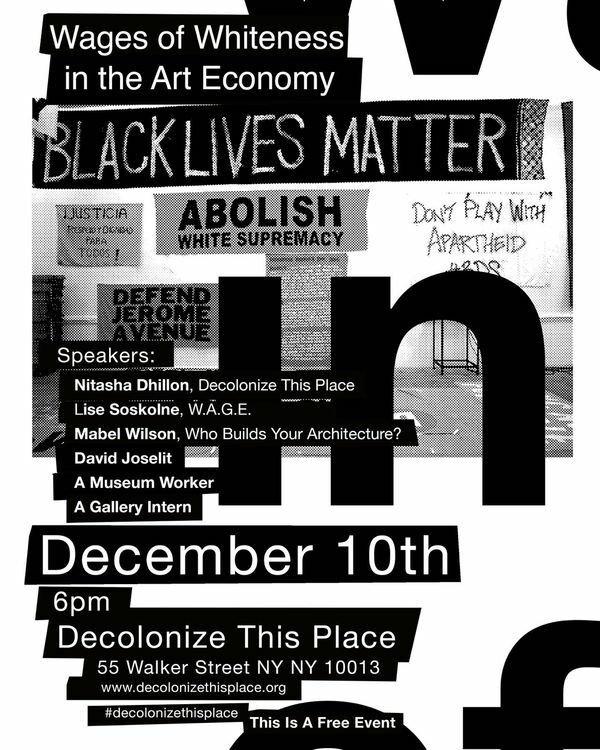 Decolonize This Place has operated on a maintenance economy that is more germane to movement-building work than the professional compensation structure of the established art world. How can such projects—which, like much movement work, rely on a political and personal commitment that is rarely remunerated—be promoted and sustained when they so evidently fall outside of art’s established commodity system of display and discrete consumption? To what degree can wider movements for reparations inflect upon the art world? In the years to come, with a Trump presidency likely to be hostile to the lifeblood of free and critical expression, movement art will be needed more than ever. Who’s going to be paying for it?" This conversation is part of Decolonize This Place, a three-month project by MTL+ on invitation of Common Practice New York hosted at Artists Space Books & Talks. For the purposes of this project, 55 Walker Street has been converted by MTL+ into a movement space action-oriented around the issues of De-Gentrification, Indigenous Struggle, Black Liberation, Free Palestine and Global Wage Workers. Views and opinions expressed in this project are not necessarily those of Artists Space or members of Common Practice New York. Eva Mayhabal Davis has worked with numerous museums, galleries, and nonprofit arts organizations with a focus on administration and art education. As a curator she produces multifaceted cultural experiences with programs such as El Salón, and is an active board member of the organization Museum Hue. Nitasha Dhillon is a founding members of MTL, a collective that combines research, aesthetics and organizing. MTL is a founder of Tidal: Occupy Theory, Occupy Strategy, and of Global Ultra Luxury Faction (G.U.L.F. ), Direct Action Front for Palestine, Strike Debt, Rolling Jubilee, Decolonial Cultural Front and Decolonize This Place. Currently, MTL is working on a film on Palestine titled On This Land (onthislandfilm.wordpress.com). Sneha Ganguly is the owner of Rajas Art Services LLC, providing art handling, collections management and project management services to arts organizations across the New York metropolitan area. You may also find her on the ramps of the Guggenheim Museum, where she freelances as an art handler. Nia Nottage is a performance artist and recent college graduate who is just beginning her career in cultural work. During the discussion she will serve as the primary source for questions related to the intern experience. Lise Soskolne is an artist and is Core Organizer of Working Artists and the Greater Economy (W.A.G.E. ), an activist organization currently focused on regulating the payment of artist fees by the non-profit arts organizations and institutions that subcontract artistic labor. Mabel O. Wilson teaches architectural design and history/theory courses at Columbia GSAPP. She is appointed as a Senior Fellow at the Institute for Research in African American Studies and co-directs Global Africa Lab. She is a founding member of Who Builds Your Architecture? (WBYA? )—an advocacy project to educate the architectural profession about the problems of globalization and labor.